Sonic Adventure 2 Battle originally came out in June 2001 for the Nintendo Gamecube. 2001… that’s a long time ago. Every once in a while, I think of this game. It’s not a great game by any means, but Kris and I absolutely loved playing it at the time it came out. The game had two story modes, Hero and Dark. Both modes were the same story but through the different points of view of the hero characters, Sonic, Tails, and Knuckles, and the dark characters, Shadow, Eggman, and Rouge. It was fun to play as both the heroes and the villains in their own unique levels going along the same storyline. Sonic and Shadow had speed levels while Tails and Eggman were in some sort of machine for their levels, and Knuckles and Rouge had treasure hunting levels searching for pieces of the broken Master Emerald. Each character could find a Chao key in their levels that would allow them to go to Chao world. There you could hatch Chao, put them in Kindergarten, feed them and level them up, throw them in combat tournaments and races. Then you could have them make baby Chao together. It was a lot of fun and honestly, I think that was my favorite part of the whole game. My other favorite part of the game was the 2-player where you competed against one another in races, battles, and treasure hunting. Kris and I would compete all the time and after we beat the game once, I think we mainly just played with our Chao (we each had about ten or so Chao on our accounts) and then competed against each other. It was a lot of fun and I remember I recorded ourselves competing and put a few videos on Facebook. I know the game isn’t too good. It was great when we were kids, but I would love to play this again just for the nostalgic purposes. The main reason I thought of writing about this game was mostly because of the music. While playing Mario Kart 8 Deluxe, I always start singing “City Escape” by Ted Poley whenever we’re racing on the Toad Harbor track. 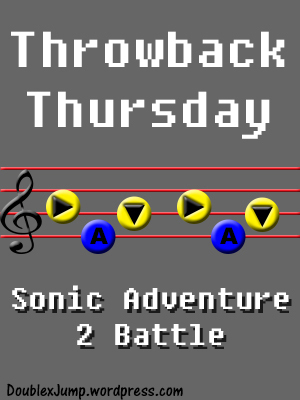 Sonic Adventure 2 Battle did have great music if nothing else. Have you played Sonic Adventure 2 Battle? How much did you enjoy it? Let me know in the comments below! Running around at the speed of sound! I love both that song and Live and Learn. I got to see the singers, Crush 40, in a concert once, and I was squealing during their SA2 performances. I really like Sonic Adventure 2: Battle. I’d consider it my favorite for nostalgic reasons. This was only my 2nd-ever Sonic game, having never grown up with a Sega system (my 1st was Sonic Advance). I loved playing as Sonic and Shadow, but I also had fun during the robot sequences. I only disliked Knuckles and Rouge’s levels. I enjoyed raising Chao though, and I even connected it to my GBA to have a miniature Chao Garden in there! So many memories. It’s the best song! And I’m jealous you got to see them in concert. It really is a good game. Looking back on it now, I feel like it was a better game than only because I was a kid. Still, I’ll replay it soon and relive the fun memories. And my Chao, lol. I played Sonic Adventure DX: Director’s Cut later and didn’t like it as much as SA2:B, but they’re both pretty good. Reminds me that Sonic interacted with regular humans long before Mario, haha! I’m not sure if I remember that one… I used to mainly watch Kris play Sonic and that one sounds familiar, lol.